24 Jan Which Lane Should I Be In When Approaching A Roundabout? As you approach a roundabout it’s essential that you get into the correct lane as soon as possible. This can be tricky, especially on multi-lane roundabouts with three or even four lanes of traffic. The roundabout is designed to help you, however, so with a little concentration you can always ensure you’re in the right lane. The question of which lane you should be in as you approach a roundabout depends entirely on which exit you are taking. If you are taking the first exit you should always be in the lane furthest to the left. If you are taking the last exit, or if you need to go all the way around and double back on yourself, you should be in the lane furthest to the right. This always applies, even on roundabouts with only two lanes and multiple exists. After that, things get a little trickier. The two most important things to do as you approach a roundabout is to decide as soon as possible which exit you are taking. There should be road signs as you approach telling you where each exit leads. They may be signposted with a road number, for example the M55, or with a destination, such as Colchester or London. There is often a second sign post after the one showing where each exit leads, which indicates which lane you should be in for each exit. Where there are no sign posts to indicate which lane to use, and often even when there are, the lanes themselves will be marked. There is limited space in a lane to clearly mark a destination so they are usually limited to road numbers and abbreviations. For example, if there is a north bound and south bound motorway, two lanes will be marked with the number of the motorway, one followed by and N, for north, and one by an S, for south. East and west can also be abbreviated in this manner. Town and city names are often abbreviated also. For example, Weaverham would appear as W’ham. If there are three exits on a roundabout and three lanes, each lane corresponds to an exit, with the first exist being the lane furthest to the left. The second exit is the middle lane, while the third is the lane on the right. This gets a little more complicated when there are more exits than there are lanes. A good rule of thumb is to use the middle lane for anything between the first and last exit – on a five exit roundabout you would stay in the middle lane for exits two, three, and four. Once you are on the roundabout, the lane you are in may split into more lanes, or allow you to follow the lane past exits you could take until you reach the right one. It’s best not to rely on this method as it can get quite confusing, but in the absence of any form of signage or road markings, it’s useful to remember. As you approach a roundabout, always give priority to cars coming from your right, unless road markings, signals, or traffic lights tell you otherwise. When changing lanes remember to always use Mirrors – Signal – Manoeuvre at every stage. You also need to time your signals to ensure other drivers have adequate time to see them, and aren’t confused. Once you’re in the correct lane, follow it until you reach your exit, and use your left indicator to show you are taking the next exit. 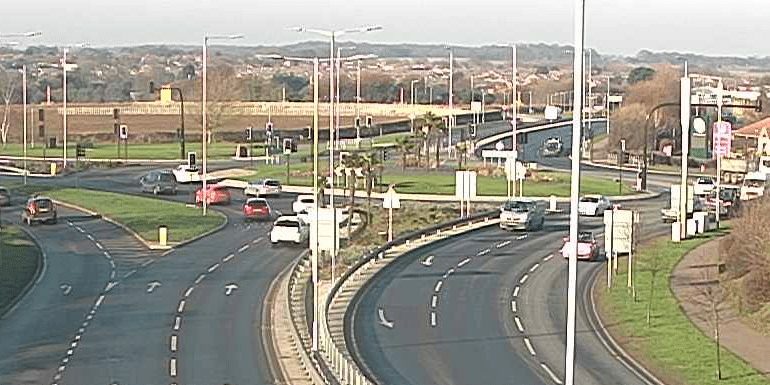 On the roundabout remain aware of the direction your lane is going in and don’t accidentally cross into another lane. You should also be aware of other drivers and anticipate that they might not be signalling correctly.